, a dissenting minister of considerable talents, was born in 1675, and was the second son of the Rev. Giles Say, who had been ejected from the vicarage of St. Michael’s in Southampton by the Bartholomew-act in 1662; and, after king James the second’s liberty of conscience, was chosen pastor of a dissenting congregation at Guestwick in Norfolk, where he continued till his death, April 7, 1692. 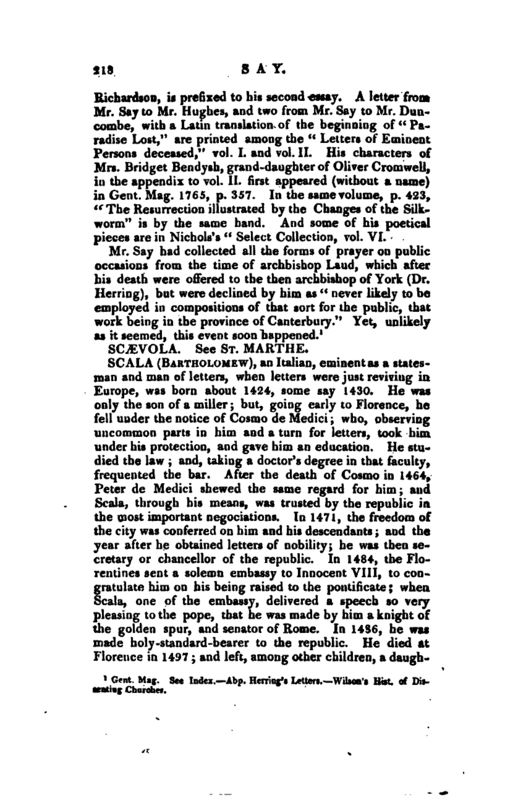 Some years after, the subject of this article being at Southwark, where he had been at school, and conversing with some of the dissenters of that place, met | with a woman of great reputation for piety, who told him, with joy, that a sermon on Ps. cxix. 130, preached by his father thirty years before, was the means of her conversion. Being strongly inclined to the ministry, Mr. Say entered as a pupil in the academy of the Rev. 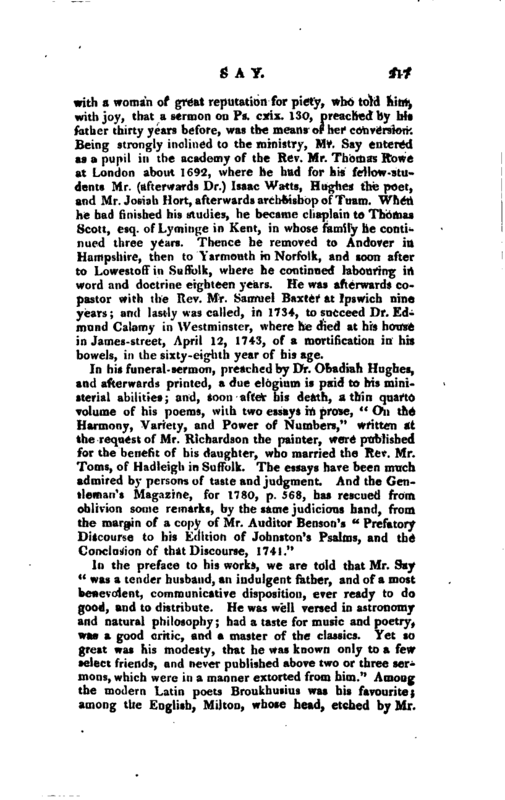 Mr. Thomas Rowe at London about 1G92, where he had for his fellow-students Mr (afterwards Dr.) Isaac Watts, Hughes the poet, and Mr. Josiah Hort, afterwards archbishop of Tuam. When he had finished his studies, he became chaplain to Thomas Scott, esq. of Lyrninge in Kent, in whose family he continued three years. Thence he removed to Andover in Hampshire, then to Yarmouth in Norfolk, and soon after to Lowestoffin Suffolk, where he continued labouring in word and doctrine eighteen years. He was afterwards copastor with the Rev. Mr. Samuel Baxter at Ipswich nine years; and lastly was called, in 1734, to succeed Dr. Edmund Caiamy in Westminster, where he died at his house in James-street, April 12, 1743, of a mortification in his bowels, in the sixty-eighth year of his age. In the preface to his works, we are told that Mr. Say te was a tender husband, an indulgent father, and of a most benevolent, communicative disposition, ever ready to do good, and to distribute. He was well versed in astronomy and natural philosophy; had a taste for music and poetry, was a good critic, and a master of the classics. Yet so great was his modesty, that he was known only to a few select friends, and never published above two or three sermons, which were in a manner extorted from him.“Among the modern Latin poets Broukhusius was his favourite; among the English, Milton, whose head, etched by Mr. | Richardson, is prefixed to his second essay, A letter. from Mr. Say to Mr. Hughes, and two from Mr. Say to Mr. Duncombe, with a Latin translation of the beginning of” Pa* radise Lost,“are printed among the” Letters of Eminent Persons deceased,“vol. J. and vol. II. His characters of Mrs. Bridget Bendysh, grand-daughter of Oliver Cromwell, in the appendix to vol. II. first appeared (without a name) jn Gent. Mag. 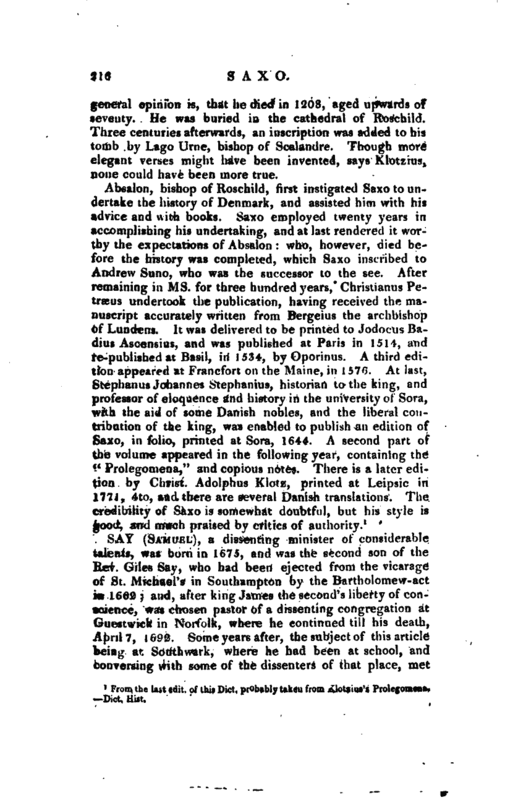 1765, p. 357. In the same volume, p. 423,” The Resurrection illustrated by the Changes of the Silkworm“is by the same hand. And some of his poetical pieces are in Nichols’s” Select Collection, vol. VI. Gent. Mag. See Index. Abp. Herring’s Letters. Wilson’s Hist, of Dissenting Churches.